Much of this year to date has been spent anticipating the outcome of the local government (LG) polls, analysing the shock result in the wee hours of 11 February, and then the possible impact of political and economic aftershocks… as our politicians mull over their next move in what is increasingly looking like a game of chess where the stakes are high. On 10 February, Sri Lankans elected more than 8,000 members to municipal, urban and divisional councils across the country – and importantly, the outcome would act as a gauge of the confidence placed in the coalition government by the citizenry. As it turned out, the eventual outcome was a slap in the face for the incumbent regime. As for the national economy, Sri Lanka’s industrial production as measured by the Index of Industrial Production (IIP) – a key indicator of economic performance in many countries – increased by 4.3 percent year on year in December. The IIP’s main purpose is to provide a measure of the short-term changes in the volume of industrial production in the country’s manufacturing sector. It also provides information to forecast future economic performance. During the fourth quarter of last year, industrial production rose by 4.1 percent compared to the corresponding three months of 2016. The nation’s corporates however, continue to employ a wait and see attitude to their prospects as reflected in the latest LMD-Nielsen Business Confidence Index (BCI), which remained steady ahead of the LG elections. THE INDEX After four consecutive months of trending north, the BCI remained stable at 128 in February – a one point increment over the previous month. What’s more, the index is now a notable 10 basis points higher than its average (118) for the last 12 months and only six rungs shy of the high (134) during this period. 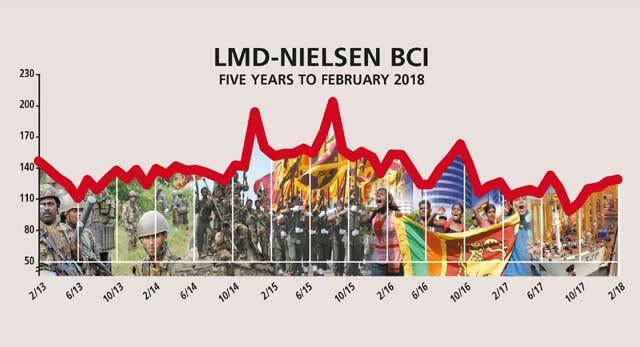 However, Nielsen’s Managing Director Sharang Pant emphasises that the latest BCI survey “was conducted in the first week of February” ahead of the elections. “Although we observe a deterioration of economic growth, projects that are currently in progress such as the Port City [Colombo International Financial City] will provide a tremendous boost to the economy once completed,” assures one businessperson. 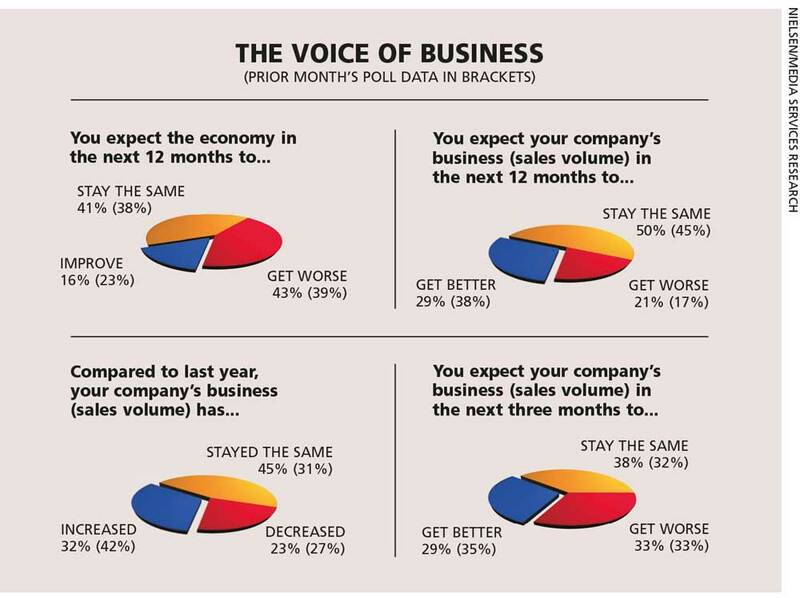 BIZ PROSPECTS Corporate executives appear to be concerned about prospects for their businesses with only three in 10 or thereabouts expecting an improvement in volumes (i.e. sales) in both the short and long terms, which is lower than in the prior month (i.e. 35% and 38% respectively). “Our business activities witnessed an improvement at the beginning of this year. And as the economy seems to be moving in a positive direction, we expect our business activities to grow further over the course of the year,” says a more optimistic businessperson. INVESTMENT Businesspeople also seem to be sceptical about the investment climate with a little over one in 10 (versus 22% in January) deeming this to be a good time to invest. “The investment climate is not in a good state. People and businesses are not willing to invest in the economy. New investments are extremely rare. Also, many foreign investments are being delayed due to inefficiencies and poor decision making by the government,” a member of the biz community laments. WORKFORCE Only a fifth (down from 33% in the previous month) of corporates polled state that they plan to increase their workforce in the coming six months with a notable majority (75%) looking to simply maintain their employee numbers. SENSITIVITIES Political instability, unabated corruption and even ‘ethnic conflicts’ are being cited as major national issues in corporate circles these days. PROJECTIONS Business sentiment remained largely unchanged from the previous month in the lead up to the LG elections but whether the status quo will persist is now in doubt as the nation and its business houses brace themselves for yet another bout of the deadly flu – political uncertainty. We wouldn’t be irrational in projecting a U-turn from the BCI’s recent trend in the short term on the assumption that Sri Lanka is heading back to times of political uncertainly, which could dampen both business and investor sentiment.